The 1994/5 seasons started with high hopes having reached the Division 2 (now Division 1) play offs in the previous season, our return to the division. With a settled, side, City never really got into real playoff contention. Dean Kiely again finished the season as an ever present, only the second City keeper to achieve that feat in 2 consecutive seasons after Graeme Crawford (1974-6). Kiely was first choice the following season but missed 6 league games following a jaw injury sustained at Hull. Without a keeper on the bench, Paul Baker went in goal and Andy Warrington stood in the crowd behind the goal with City supporters directing Baker. Warrington made his City in The Coca Cola cup tie with Manchester United 3 days later. Kiely left City under slightly acrimonious circumstances in August 1996. Out of contract, he had talks with Bruce Grobbelaar’s Plymouth before signing for Bury. Initially, he went to Bury for talks with their manager out of courtesy, not expecting to join a club who had just been promoted from the basement division and the bookie's favourite for immediate relegation. He was talked around by Stan Ternant's sweet talk. Against all odds, Bury were promoted for a second successive season and Kiely was later quoted as rating Ternant as the best manager he'd ever played under. Leaving City a few months earlier was a 16 year old schoolboy keeper, Paul Robinson, presumably, one City felt wouldn't make the grade with Kiely and Warrington around. He joined Leeds, the rest is history. Over the next 3 seasons, Warrington never truly established himself as City’s first choice keeper. For 1996/7, Warrington shared keeping duties with Tim Clarke and Mark Prudhoe. A season later he was understudy to Mark Samways and in 1998/9, he was understudy to York born, ex England under 21 keeper Bobby Mimms. Warrington went onto play over 400 league games, mainly for Doncaster and Rotherham and usually at a higher level than City before leaving league football in 2013. For 2015/6, he was number 2 keeper and keeper coach at Grimsby. 1999/2000 saw Bobby Mimms largely retain his place, but also saw a debut for youngster Russ Howarth (he played the first 4 games of the season before losing his place after a 6-3 defeat at Barnet). Howarth made club hstory in February 2000, when he became City's first ever sub keeper, replacing the injured Mimms against Plymouth. He played the next game before giving way to new signing Alan Fettis. Quite a season for City keepers, England B, England Under 20 and full Northern Ireland internationals respectively. Fettis was an ever present in the following season whilst Howarth continued to represent England’s junior age sides all the way through to the Under 20 side. The same order seemed certain to apply in the 2001/2 season, until Howarth was given a game on the final day of the 2001/2 season. By now Howarth had become disillusioned with reserve team football with City and trials with Spurs, Everton, Newcastle and Wolves followed. He signed a week by week contract in September 2002 but left to join Tranmere for £25,000 in November 2002. With Fettis nursing a broken finger and Howarth not wanting to play in case he picked up an injury which might scupper a big money move, the 2002/3 season started with new short term signing Marlon Beresford in goal for the first 6 games before his deal ended and he joined Burnley. Fit again Alan Fettis resumed his duties until he was released to join Hull in January 2003 during City’s financial / ownership crisis years. In 2011, he was to become an academy coach at Manchester United and played a reserve team game for them when both keepers became ill in the build up to the game. Another Northern Ireland international, Michael Ingham was signed on loan from Sunderland and played 17 times for City in 2002/3, a minor injury meant the emergency loan signing of Phil Whitehead from Reading in April; he made 2 appearances before Ingham recovered. In 2002/3, City used 4 regular keepers and 2 outfield players went in goal during games. For 2003/4, the late Mark Ovendale kept goal with deputy Chris Porter making his first 5 appearances. Both signed after a deal to bring Marlon Beresford back to the club fell through due to insurance problems concerning an old back injury. Incidentally, Beresford had a Burnley fanzine (Marlon Beresford’s Gloves” named after him). Our return to non league started with new signing Paul Crichton in goal. He lasted just 4 games before a very public falling out with City fans at Gravesend and his departure (probably released at the end of a 4 week short term contract rather than being sacked as sometimes reported). Crichton released. Chris Porter and David Stockdale shared keeping duties for the rest of the season before Porter assumed seniority over Stockdale for the 2005/6 season. Both keepers were released at the end of the season. Stockdale / Porter - Mascot For A Day. For 2006/7, Tommy Evans was recruited and he played every game bar one, when youngster Arran (son of Jimmy, a 70s City reserve midfielder and Rowntree Mackintosh stalwart for many years) Reid started. The season ended in a play off semi final defeat at Morecambe, some blaming Evans for our defeat. Whatever, he retained his position for the next season and was a regular except for a handful of games when loanee Stephen Henderson and second string Josh Mimms deputised. Mimms, arriving in October 2007 was to stay for nearly 3 years, but struggled to make the first team. Bobby and Josh Mimms are the only final and son to keep goal for City. Michael Ingham returned to City in early summer 2008 and soon cemented himself in the first team as City reached the new Wembley for the first time in May 2009 and a FA Trophy Final defeat against Stevenage. Mimms and loanee Artur Krysiak, the then current Polish Under 19 keeper, made a handful of appearances, Krysiak looking assured before a dislocated finger in his second City appearance cut short his stay. His 2 games resulted in 2 wins with clean sheets. Newspaper reports at the time indicated that Birmingham had waived their right to a £1,000 per game loan fee. Later in the same season, he was playing Championship football for Swansea. The following season, Ingham missed just one game (Mimms again replaced him) as City again reached Wembley and a play off final defeat against Oxford in 2010. Some blamed Ingham and his defence for conceding 2 early goals from which City never recovered. Australian Simon Miotto joined as keeper coach in February 2010 and was registered as a player for the rest of the season without playing. In 2010/11, once again Ingham missed just one game, suspended after a sending off, and was replaced by David Knight on a season long loan from Histon. Ingham’s unchallenged run continued during the 2011/2 season, missing only the final 3 league games of the season with a slight knock. 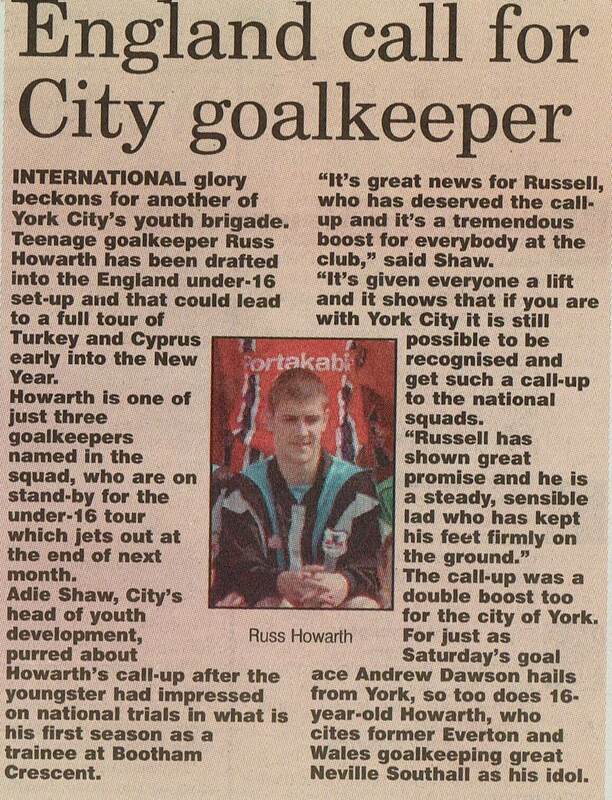 Paul Musselwhite, City’s 43 year old keeper coach was required to fulfil his other role as second keeper. He became City’s oldest debutant and oldest ever City player as he oversaw 3 clean sheet wins. His perfect record (games / wins / clean sheets) over 3 games has never been achieved by any other City keeper. Back in The Football League, Michael Ingham was an ever present in 2012/3 as City secured survival on the last day of the season. Musselwhite remained with the club until March 2013, 2 days after Gary Mills was sacked. New manager, Nigel Worthington brought in ex keeper Fred Barber as his assistant and loanee keeper Arron Jameson from Sheffield Wednesday to sit on the bench for the rest of the season. Ingham retained his first team position at the start of the 2013/4 season. Season long keeper loanee, Chris Kettings made his only City appearance against Bristol Rovers in an FA Cup replay in November. Nigel Worthington sought to bring in another loanee as City once again struggled. Nick Pope arrived from Charlton and impressed in 2 games before being recalled due to a keeper crisis at Charlton. Immediately Worthington brought in Aaron McCarey from Wolves who played in the next 5 games. Kettings lost patience and asked to return to Blackpool. After McCarey’s loan ended, Ingham regained his place for 3 games before Nick Pope returned and was to play in every remaining game that season. Shortly after he arrived, City went on an impressive run surging from the relegation places at new year to claiming a play off place. In his 22 games for City, Pope kept 15 clean sheets. Attempts to re-sign Pope for the 2014/5 season failed. However, Pope did enjoy another successful basement loan spell at Bury during the following season which ended in promotion. Back at Charlton, his progress was slow, a couple of howlers didn’t help, before he established himself in their Division 1 side. A move to Premier League Burnley followed in July 2016 and although waiting over a year for his debut, injury to Tom Heaton saw him make his debut in September 2017, quickly establishing himself in goal and earning many plaudits and high ratings in the keeper stats. An England call up followed in March 2018, at the time he noted, "I always refer to my move to York City in 2014 as the one which changed everything for me". Jason Mooney, a giant (and at over 6 foot 8 inches, City’s tallest ever player) signed on a free transfer from Tranmere started in goal, but struggled badly and was subbed by Ingham at half time in our 3rd league game. Ingham maintained his place, although he himself was subbed at half time by Mooney when feeling unwell at Newport in October, Worthington’s last game as City manager. Neither keeper convinced new manager Russ Wilcox who brought in loanees, Alex Cisak (October) and then Bobby Olejnik (January). When Olejnik took a knock in April, Mooney was recalled from an impressive loan spell at Conference side Alfreton and Ingham was re-instated in goal, a couple of clean sheets followed as Ingham closed in on Tommy Forgan’s club record number of City clean sheets. Flinders tribunal - the FA ruling. 34 year old Jon Worsnop made his City debut on the opening day of the 2017/8 season. His signing seemed to mark a shift in policy, approaching, if not already at the veteran stage, he’d enjoyed a solid career, although usually at clubs often considered to be on a lesser level than City. FL appearances. Afer conceding a penalty at Harrogate and the same again in the next game at South Shields, when he was dispossessed with the ball at his feet, he was dropped in favour of Luke Simpson for the next game, a win over Brackley which was Martin Gray's first game as manager and Simpson's last for the club. Under Gray, Worsnop assumed goalkeeping coach duties until he left the club in November 2017. Gray turned to Bailey Peacock-Farrell, signing the 20 year old from Leeds on loan, a player known to Gray from a loan spell at Darlington during the previous season. Conceding 9 goals in his 4 games, its probably fair to say, he struggled to cope with “men’s football” and didn't set the world alight and after Gray managed to sign Adam Bartlett following prolonged negotiations, he returned early to Leeds. It was to his credit, that having played just once for Leeds in April 2016, he returned to their first team in February 2018 in the 3-0 home defeat against runaawy leaague leaders Wolves, he was man of the match and coninued to impress, making his Northern Ireland Under 21 debut a month later. Initial thoughts seemed to suggest Bartlett's part time role at Darlington and coaching duties at Middlesbrough were more lucrative than a full time role with City. Having played on trial with City in July 2007 and subsequently enjoyed a long career, he was considered a safe pair of hands and a leading non-league keeper. After signing, he enjoyed an unbroken run in City's team, possibly not quite living up to his reputation as a leading non-league keeper, but generally proved to be a safe pair of hands. On reaching 25 City appearances, Bartlett qualified for inclusion in the list of City's all time top keepers, entering the chart as our 21st best ever keeper. Elsewhere, the season was notable for Nick Pope, City's ex loanee keeper establishing himself in Burnley's side that finished 7th in the Premier League, in March, and he received his first call up to England's full team. Meanwhile, 3 former City keepers were still keeping at a level above City in the English pyramid (David Stockdale (Birmingham), Kyle Letheren (Plymouth), Scott Flinders (Cheltenham)) as were 7 former loanees (Nick Pope (Burnley), Scott Loach (Hartlepool), Stephen Henderson (Forest & Portsmouth), Artur Krysiak (Yeovil), Bobby Olejnik (Mansfield), Bailey Peacock-Farrell (Leeds) and Richard O'Donnell (Walsall)).